DXRacer Elite Series ▷ Size & Buying Guide on GOTURBACK.UK! The DXRacer Elite may be considered by some as wrongly named. ‘Elite’ usually implies that something is the best, this chair is not that. The Elite does provide users with adjustable components and a number of features that you’ll find on more expensive models, but it isn’t the best gaming chair you can buy. Unlike others in the DXRacer series, it isn’t the most attractive design and isn’t as ergonomically put together. If you’re looking for a cheap chair though, the Elite may be worth considering. If you aren’t too concerned about looks or high-quality materials and you just want something that is better for your posture when you are gaming, this chair should suffice. The Elite’s quality and functionality are admissible, but it won’t win any awards for being the best gaming chair around. It does have features that you would expect to find on pricier models, like a class 4 gas lifting feature, and 3D armrests but it isn’t much to look at. A positive feature is that you won’t have to buy neck or lumbar support cushions, as these are included. The base is crafted from nylon which isn’t as heavy duty as other models on the market with aluminium bases. 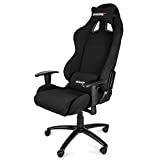 It’s probably a good chair for those that don’t want to spend much but want something a bit more supportive to game in. There are no premium features like a leg rest or a specially designed footrest base. The chair is plain and simple. The maximum user weight limit is low at 77KG, so it is probably best for children or lighter adults. The chair features a backrest which is higher than average to provide more support to the spine and neck, it also tilts. Material wise, the chair is coated with a leather style vinyl and built on a steel frame. The neck support is built into the design of the chair and is not removable like higher end models, the lumbar cushion, on the other hand, is removable. Like others in the range, it has nylon casters which are designed to prevent any damage to flooring. Overall the chair is very limiting, and those considering purchasing it should be aware of the weight and height restrictions, along with the lack of a removable headrest. The quality of the chair is good but not as good as more expensive models, it’s a good upgrade from an office chair but may sit best in a child’s bedroom. The DXRacer Elite although it isn’t very stylish in its design, does come in a range of colours to make the look of the chair more appealing. The colours include grey/black, white/black, red/black, gold/black, and black. Accessory wise, the chair comes with a free lumbar support cushion, as mentioned the neck support is integrated which for some is a positive feature, but it does come with its limitations. The Elite is not a chair for the average person or anyone on the heavier side. The weight limit is very low at 77KGs, which for many people just isn’t going to cut it. The height limit is also very low at just 5ft 6, which means it probably is more suited to children or shorter and lighter people than most other gaming chairs that are currently available. If you are not light as a feather and on the short side, then this may not be the chair for you, It is an average gaming chair but it is very restricting for adults of average height and weight. Still haven’t found your perfect match? No problem, I got your back!